This metal Bath Fizzy Scooper is perfect for forming soap balls and round bath fizzies! Avoid a mess and save time when creating homemade bath fizzies with this tool. To make the tedious process of molding bath fizzies quicker and easier! Create uniform sized bath fizzies and soap balls. This product does need not to be listed on the product ingredient label. Scoop bath fizzy mixture to fill both sides of scoop. Firmly press scoops together. Push finger in the holes at the top and bottom to ensure bath fizzy is tightly pressed. Using a spoon, tap along the seams of the scooper and on the top and bottom. Carefully open and remove the bath fizzy. Set on clean surface to dry. Repeat to make more bath fizzies. If you are having trouble with the sides sticking, adjust your recipe. COMMENTS: Just what I needed!!! Perfect for guests!! COMMENTS: These are just the size I've been looking for. They would be perfect for small fizzies that go into a pack or small jar. COMMENTS: I tried and tried to get this thing to work, but I just could not make the molds fully round or equal on each side. I tried scooping large clumps and then packing more in through the holes on each side but to no avail. Perhaps it's user error, but I feel like I shouldn't have to be a rocket scientist to make this tool work. I feel like it was a total waste of money. COMMENTS: I used to use 2 part fizzy molds. I had trouble with them coming apart when I unmolded them. I tried this right away as I had an order to fill. It was excellent to work with and less messy than my previous 2 part molds. • ease of use and product consistency. COMMENTS: Its ok, seems to work fairly decent but not as good of quality as I would've liked. COMMENTS: Great for molding bath bombs! Very easy release! "I absoutely love this product!" COMMENTS: This is the only tool that I have been able to successfully make bath bombs with. I was ready to give up! Once I got the knack of getting my mixture to the right consistency, it was a breeze. If a bomb breaks up or does not look right, I just dump it back the bowl and adjust my mixture with more witch hazel spritzes (if it is too dry) or let it dry out some if my mixture is too moist. "perfect scooper for bath bombs"
COMMENTS: makes small bath bombs! it is great if you are making for a small kid! "Nope it didn't work for me"
COMMENTS: I've tried everything to make bath fizzies, and nothing worked. I was hoping that this would work. But Nope it didn't work. just could not get either side to stay together. I was really hoping it would work too. I don't know maybe if it didn't have the big holes on either side. I just wish there was something on the market that would help. Maybe you have to have a knack for it I guess. COMMENTS: I'm so glad I ordered this! It saves me so much time! I had been using the 2 piece plastic molds and I had a problem making the two sides stick together. I still have the sticking together problem with the scoop but it's far less frequent!!! I've found if you don't overfill the scoop, it will stick together easier! COMMENTS: I have always struggled with creating bath bombs, but this tool made them SOOOOOO easy!! They are small, but my customers love them! COMMENTS: I have the same problem so many others write about, getting two halves to stick together. With this scoop you just take a "bite" out of the bowl and close the scoop shut, it sticks!! Its a time saver. I have not had problems getting the scoop to release the bomb once its made either. Pretty handy little tool. COMMENTS: I have been trying to make a round bath fizzy for almost 2 yrs-tried every different round mold(plastic and otherwise), and just couldn't do it. I finally resorted to making them in a small guest size swan mold(which really sells well too), but still wanted to get the round shape. I finally got to order this scoop, got it today(1/15) and have already used it-it is fantastic! Took me a bit of working with it, still not perfect every time, but works great pretty much 95% of the time. And the other 5% is not the scoop, it's the operator. Will keep this as a staple stock of my tools! • the handles are a bit hard to manuever. COMMENTS: I bought this on a whim and glad I did! It is both fun and productive to use for my bath bombs. It gave me that extra size I needed. I need one for meatballs now too! It takes all the work out of it. COMMENTS: I LOVE this for making my bath bombs. I ordered this item a while back, as I wanted to have it available once I started making my bath bombs. If I would have known how easy bath bombs making would be because of this gadget, I would have been making bath bombs long ago. I must have for bath bomb makers, especially beginners. "Not too big, not too small"
COMMENTS: When I first got it I thought it was way too small. I really considered sending it back but I had just got a new bath bomb recipe that I wanted to try out so I went for it. I am so happy that I did! It was super easy to use and to unmold. My bride that I showed them to loved the size as well. Now I am thinking about getting another one. Give it a try. COMMENTS: It's a easy to use but doesn't always release the bath bombs in one piece. Takes several tries. COMMENTS: This is a handy little tool. Love it. COMMENTS: I love this little Fizzy Bomb Maker. It is the perfect size for bath bombs that makes them affordable to customers. I sell these much better than the larger ones. "not what why i thought "
COMMENTS: This actually hurt my hand when I used it. Also my fizzies would not stay together. I tried every way to keep them together but nothing worked. I have switched to soap molds. COMMENTS: I like this tool but haven't quite got the hang of it yet. Can't get the 2 sides to stick together, I think my batch is to dry.I would purchase another one when this one wears out. COMMENTS: I was hoping for a smaller scoop, but this still works fine for it's intended purpose. COMMENTS: This is awesome! So easy to use and gets the job done quickly. • Make the finger holds a little padded. COMMENTS: After reading reviews I wasn't sure about purchasing this tool. After some practice and persistence, it is a definite thumbs up for me. Bath fizzies can fight back, but after mastering the use of this tool, it makes really uniform nice bath fizzies so I am very pleased. Yes your hand does get tired but it does yield good results. I'm very happy that I purchased this. COMMENTS: Great product! I had so many failed batches of bath bombs before ordering this wonderful scooper. Easy to use, great price! COMMENTS: The size is perfect for the shower bombs I make. I love how easy it comes out. I was using a sphere type mold just a little bigger than this - which is ok but I enjoy how easy this is to work with. COMMENTS: I received this today and immediately put it to work. I love this scooper! It is really easy to use. I was a bit hesitant since a few people commented that they couldn't get it to work. Here is the trick: Do not pack each half and try to force them together. Instead, dip the scooper into the pile of bath bombs/fizzies powder. Be sure you grab too much and squeeze. Dust off the excess and open the scooper. And just like that, you will have a perfect bath bomb! I highly recommend this. "Makes Uniform Bath Fizzies When Used Correctly"
COMMENTS: We use the bath fizzy super scooper with all of our recipes. 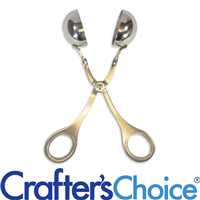 The super scooper allows us to make professional looking balls with very little effort or time. It can be hard to use at first and get both sides to stick together but we found that with a little extra moisture and effort it works every time. If you need to make bath fizzies that are completely uniform you must invest in this scooper. Don't get discouraged if it doesn't work right away, it takes time and effort to get the correct feel for it. • Different Sizes Would Rock!! COMMENTS: Love using this for bath bombs! Works great! COMMENTS: These make a nice avg. 2oz fizzy every time! Very quick and easy! Sturdy, well made. I don't see this breaking anytime soon. "Perfect Bath Bombs every time!" COMMENTS: Love this little tool! Perfect fizzies every time. COMMENTS: No problem forming fizzies with this tool with MY recipe! Worked perfectly the very first attempt...I love it! COMMENTS: It's a bit tricky at first, but once you get the hang of it, it works great! These are a big hit with everyone. "What is the approximate weight of each fizzy ball?" Staff Answer These bath fizzies weigh approximately 2 ounces. "Once you make a bath fizzy with this scooper. What shrink band would work best for each bomb to protect them?" Staff Answer You might try the 95 x 55 shrink band to fit your bath fizzy. "What is the diameter of the ball once done using the scooper?" Staff Answer The scoops are 1.75" wide at the bottom. "Do the tops of these have the open holes like a normal meat baller?" Staff Answer Yes it does. "no matter how hard I try I cant seem to get the fizzy out whole! It breaks into two pieces... is there something I can do to help eliminate this problem? Thanks!" Make sure you are spritzing with enough alcohol that the mixture is clumping (not too dry). Instead of packing each side of the scoop, try just reaching into the mixture and grabbing a large amount with your scooper and then squeeze shut. I keep my scoop(s) in the freezer. My fizzies don't stick in the scoop when it is cold. I have a few scoops so I keep them clean and in the freezer so I can grab another scoop from the freezer when the scoop I am using starts to get warm (from my hands) and won't release the fizzy. "Is this product made of stainless steel or aluminum?"